First Christian Church - SERMONS - Will He Find Faith? Luke 18:7-8 And will not God give justice to his elect, who cry to him day and night? Will he delay long over them? I tell you, he will give justice to them speedily. Nevertheless, when the Son of Man comes, will he find faith on earth? Jesus said this to encourage us to have faith, pray, and not give up. Faith in what? Faith in God. Why will the Son of Man be looking for faith? Because, faith in God is essential. Although we do not earn anything by faith. Faith brings us into a right relationship with God and we enjoy the blessings of this relationship. Faith gives God the opportunity to conform us to the image of His Son. To do that, God has to frequently knock the bottom out of our easy life in order to get us into contact with Himself. He want us to understand that it is a life of faith in Him, not a life of sentimental enjoyment of His blessings. Therefore, God will withdraw His conscious blessings at times in order to teach us to walk by faith. After we go through that testing of our faith, we are worth far more to Him and mankind than we were in our days of conscious delight. Faith by its very nature must be tried, and the real trial of faith comes when everything we experience seems to contradict the character of God. God is love and at those times, our flesh cries, “How could God exist and love me, and allow this to happen?” Faith in God that says, “Though He slay me, yet will I trust Him” (Job 13:15). 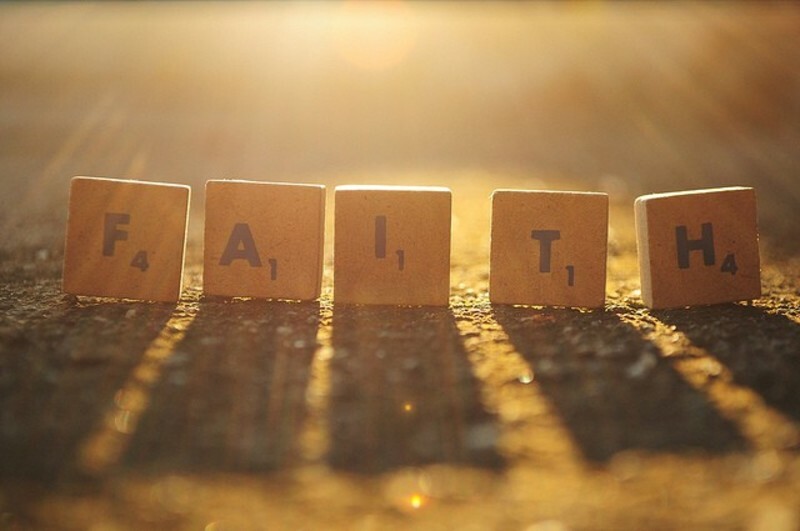 So what is faith? Hebrews 11:1-2 Now faith is being sure of what we hope for and certain of what we do not see. This is what the ancients were commended for. The heroes of faith, mentioned in Hebrews 11, were not people who vaguely trusted that ‘somehow everything will work out right.’ They were heroes who died for being faithful (acting on their faith), not faithful to a principle, a denomination, or a creed, but faithful to a Person, Who is faithful to His promises. The faithful believes that God engineers circumstances. To be faithful in every circumstance, even in face of death or torture, means that we have only one loyalty, and that is to our Lord Jesus Christ. If we don’t give up and we allow His Spirit to work in us, then God’s faithfulness will be evident in our lives, too. The more we yield to the Holy Spirit, the less fickle, the less vulnerable to discouragement and temptation we’ll become. Others will find in us reliability, trustworthiness, staying power through both good and bad—a faithfulness that the world doesn’t understand. We may get discouraged. We may be disappointed at times. Nevertheless, faithfulness says, “Even though there is discouragement and disappointment, even if I die, I will not let go, I will not quit. I will keep on because God has heard my cry and called me to be faithful until I see His justice." Many of us get depressed about ourselves because of our lack of faithfulness. The good news is when we get to the point where we are really honest about our sin nature, then we shall understand what the Atonement of the Lord Jesus Christ means. It means that we come to Him without the slightest pretense, without any hypocrisy, and say, “Lord, all I can do is fail. Take control of my life. Forgive my sin and fill me with Your Spirit.” And God will answer that prayer. He has been waiting for us to come to this point; and until we do, we retain control of our life, operating in the flesh, and doomed to more failure. Faithfulness is a fruit of the Holy Spirit. To develop faithfulness we need to realize that an apple tree doesn’t stand out in the middle of an orchard saying, "Now how do I develop apples?" Jesus says in John 15:5“I am the vine; you are the branches. If a man remains in me and I in him, he will bear much fruit; apart from me you can do nothing. As born again Christians, we are a branch grafted to the vine, who is Jesus Christ, and we produce fruit because that’s what Jesus does. We don’t have to sit around and think about it and analyze it. We should not even look for fruit, we should look at the vine, Jesus Christ. However, we do have to be careful that our branch is never detached from the vine, by some sin that separates us from Him. How can we prevent that? First, we need to realize that temptations will come. Just as surely as Jesus was tempted to be unfaithful, we will be tempted to be unfaithful—in our marriage, in our relationship with the Lord, and in the church. That’s what Satan does. He will tempt us to be unfaithful. Expect it, be vigilant, and resist temptation by the power of Jesus Christ living in you. Secondly, we need to seek the Holy Spirit’s power and develop regular, positive, spiritual habits (prayer, reading, worship). This world is not a Christian world. And we’re being pressured on every side to develop negative habits, tempting us to be unfaithful in church attendance, to be unfaithful in prayer, and unfaithful in studying and obeying the Word of God. If we seek the Holy Spirit daily, God is faithful to give us grace to produce the fruit of the Spirit and become consistent, trustworthy, and faithful. 1 Corinthians 1:8-9 He will keep you strong to the end, so that you will be blameless on the day of our Lord Jesus Christ. God, who has called you into fellowship with his Son Jesus Christ our Lord, is faithful. 1 Thessalonians 5:23-24 Now may the God of peace himself sanctify you completely, and may your whole spirit and soul and body be kept blameless at the coming of our Lord Jesus Christ. He who calls you is faithful; he will surely do it. Finally, when we do fall, we need to repent, get back up, and follow Jesus. God will not disown us—unless, we disown Him. 2 Timothy 2:11-13 Here is a trustworthy saying: If we died with him, we will also live with him; if we endure, we will also reign with him. If we disown him, he will also disown us; if we are faithless, he will remain faithful, for he cannot disown himself. Faith must be tested before we can become faithful. Even if we fail a test, God loves us and does not disown us. He is faithful to let us retake the test until we pass it and become faithful. The key to passing the test is faith in Jesus, not faith in our faithfulness. Follow Jesus obediently and everything you come up against will develop your faithfulness. Faith never knows where it is being led, but it knows and loves the One Who is leading. It is a life of faith, not of intellect and reason, but a life of knowing Who we are following. There is continual testing in the life of the faithful, and the last great test is death. Even then, we will be given grace to pass the test faithfully. The Apostle Paul experienced all kinds of persecution, all kinds of discouragement, all kinds of temptations. Sometimes he fell, yet he remained faithful to Jesus Christ. Facing execution, Paul wrote these final words to Timothy, 2 Timothy 4:6-8 For I am already being poured out like a drink offering, and the time has come for my departure. I have fought the good fight, I have finished the race, I have kept the faith. Now there is in store for me the crown of righteousness, which the Lord, the righteous Judge, will award to me on that day—and not only to me, but also to all who have longed for his appearing. Faith is a gift from God, the Holy Spirit. To receive this gift of faith, we must first listen. Romans 10:17 So then faith comes by hearing, and hearing by the word of God. When faith comes, it demands a response. Without a response, it is only mental assent and not faith. Mental assent will not save us. That is why faith calls us to repent and be baptized. Ephesians 2:8-9 For it is by grace you have been saved, through faith--and this not from yourselves, it is the gift of God--not by works, so that no one can boast. Faith is God’s gift by which we believe. What we believe is what we do—all the rest is just religious talk. We are not saved by what we do, but if we really have faith in God, we will do what God commands. For example, notice what the first believers in Jesus Christ did after hearing the Gospel and receiving faith to believe it. Faith is not a feeling. It is a real relationship with a real person—Jesus Christ, the Creator and Lord of the universe, who wants us to know Him intimately. The results of faith is not just about salvation, but transformation. As we follow Jesus, we become transformed on a daily basis from one degree of glory to another, by the power of the Holy Spirit. We grow in faithfulness and holiness. By God’s grace, we become Christ’s ambassadors to the world. When that happens, we can expect to suffer by the hands of those who hate Jesus. By faith, we can endure our sufferings. If we were called to suffer without the gift of faith, we could not bear it. Some suffering is necessary, for if we never suffered, our faith would fade, as we would have no reason to continue to put our trust in God. Philippians 4:12-13 I know what it is to be in need, and I know what it is to have plenty. I have learned the secret of being content in any and every situation, whether well fed or hungry, whether living in plenty or in want. I can do everything through him who gives me strength. Since faith is a gift, let us quit evaluating our faith—“is it strong; is it weak, is it the size of a mustard seed”. Let us focus on Jesus Christ, our Savior, the object of our faith, the giver of faith, and love Him with all our heart, soul, mind, and strength. If someone says, "I really love the Lord," and then is unfaithful, it’s hard to believe that he really does love the Lord. It is the same as if a husband says, "I really love my wife," and then he goes out and has an affair. You may call him a liar. You may call him a cheat. But most of all, you may say, "He is unfaithful," because that is what he is. And no matter how strong his arguments may be, no matter how loudly he proclaims his love for his wife, you will not believe him because his unfaithfulness negates his proclamation of love. Contrast that to God’s character, Psalm 100:5, For the LORD is good and his love endures forever; his faithfulness continues through all generations. Psalm 33:4 For the word of the LORD is right and true; he is faithful in all he does. Therefore, follow Jesus and let our actions show we have faith and love the Lord with all our heart. Perfect love is the rest God has for His people. He wants us to rest in His love, trusting that He will always give justice to his elect, who cry to him day and night. If God does not answer of our prayers as we hoped, we can be sure He has some great eternal reason for not doing so. And we must have faith that whatever God permits in our lives - it will work for the good of those who love Him. That is faith in God. Romans 8:28 And we know (we are sure, certain, we have faith) that in all things God works for the good of those who love him, who have been called according to his purpose. If you’re here this morning and you don’t know Jesus as your Lord and Savior, I want you to know that Jesus didn’t quit when He faced the cross. Jesus said, “Not my will, but thine be done.” He was faithful to the will of the Father. He went all the way to the cross and gave His life so that you and I might have the promise of everlasting life. God had a purpose for Christ’s suffering and He worked it for good to the salvation of all mankind. Therefore, the Son of Man has come and justice has been done. Now, no one has to go to Hell if they will believe and have faith in what Jesus has done for them. This salvation is available to you only through faith in Jesus Christ. It has nothing to do with how good or bad you have been. It has nothing to do with how good or bad you will be in the future. “All have sinned and fall short of the glory of God.” Salvation is totally based on faith in Jesus and what He has done to atone for all our sin. No one comes to the Father except through Jesus. He is the Way, the Truth, and the Life. If the Holy Spirit is convicting you of sin, righteousness, and judgment, then He is also giving you enough faith to believe that Jesus is the Son of God, who gave His life on a cross to atone for your sin. We encourage you to yield to the Holy Spirit and give your life to Jesus today by repenting of your sin—that is, of being your own god—and following Jesus in baptism. Then you will be born again of the Holy Spirit and your faith will increase every day as you walk with Christ. He is faithful and He will do it. And when you fail a test, (yes, we all fail a test now and then) you’ll find His love, comfort, and strength to repent and start following Him again.